The new car-based crossover Pathfinder is quite a departure for Nissan. 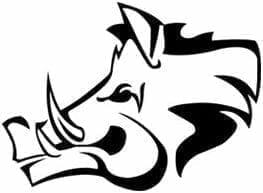 This model has always appealed to those that required a little more ruggedness from their SUV, as it was built on a truck platform and was a capable off-roader. Of course, owners paid the price with horrifying fuel economy and a truckish ride. As of last year, the Pathfinder is technically a car underneath, and for 99% of buyers, that’s probably a good thing. It’s come into the middle of the road, and provides what most of us need most of the time. Still looking for an off-roader? You won’t find it in the Pathfinder anymore. The formerly rugged Pathfinder has met head-on with a giant belt sander. All the square edges and brawniness have been knocked off and we’re left with a sleeker, pleasing albeit vanilla shape. It’s well-done, and though nobody will give it a second look as it drives by, nobody will cringe either. Like I said – middle of the road. Welcome to Toyota territory, Nissan. I did quite enjoy the massive 20″ rims – they look great! 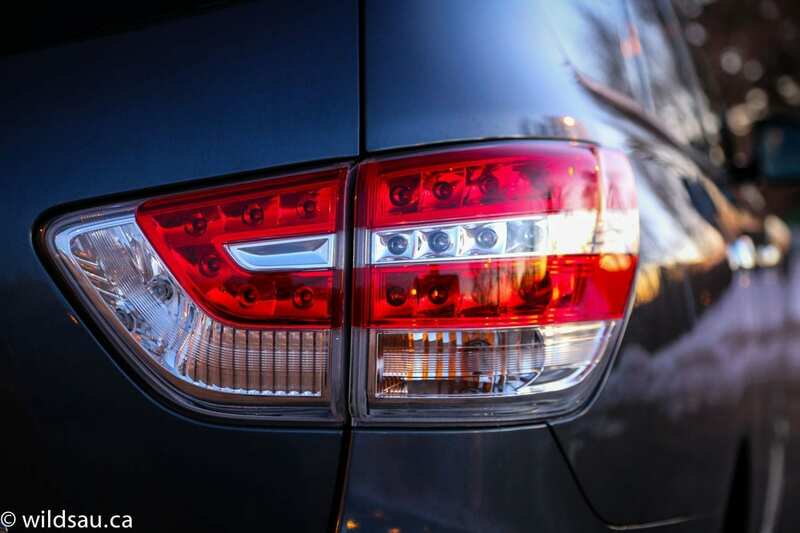 LED tail lights give it a nice light signature at night, but I was a bit surprised to find a lack of HID headlights at this price. 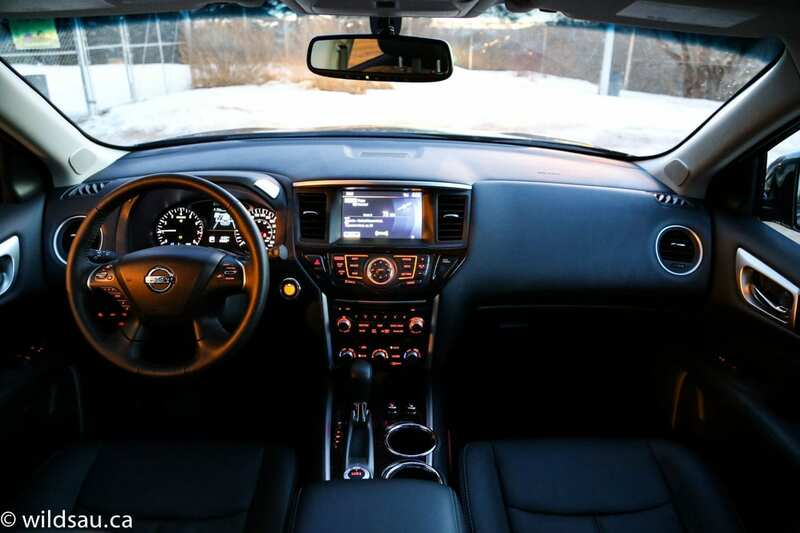 The Pathfinder’s interior is nicely crafted. It’s pretty blandly styled – it works, but much like the exterior, it’s nothing to write home about. The entire dash is built out of hard, black plastics and it does come across as a bit behind what current passes as the norm. It’s not bad, but it’s not great. The leather-upholstered power-adjustable seats are heated and cooled – I found them very comfortable and surprisingly well-bolstered too. There was plenty of head room for my 5’10” size. 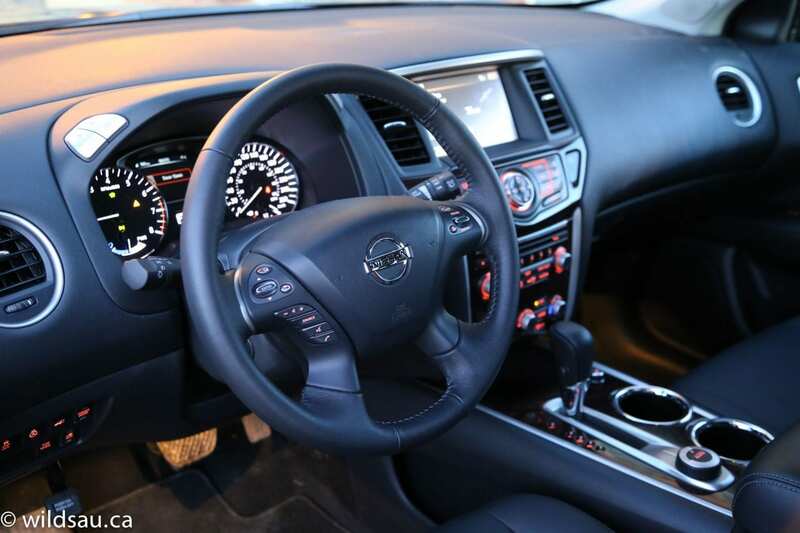 The heated, power-adjustable steering wheel feels good and has switchgear for media, cruise control, phone, handsfree and the driver information screen. 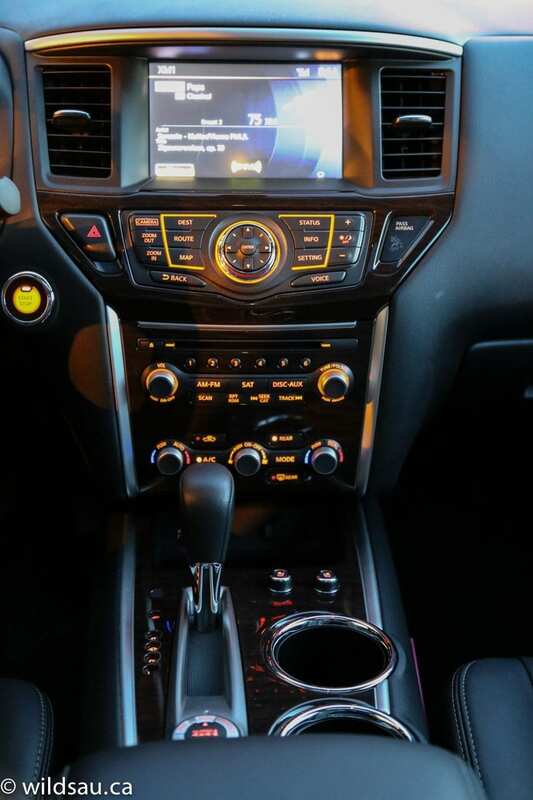 A large 8″ touch-screen sits front and centre (it’s also controlled by Nissan’s strange combination of hard directional buttons, a rotating ring and an enter button) and handles the media, phone, navigation, cameras and vehicle information. 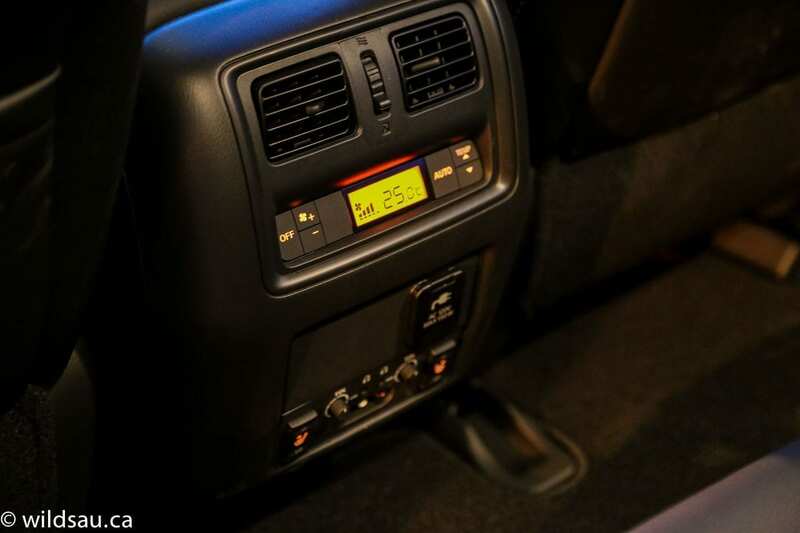 Below it are more hard buttons for the BOSE media system – it sounds good – and at the bottom of the stack is a tri-zone automatic climate control system – dual zone up front and it allows you to control the back too. A couple of cupholders, the gear selector and the all-wheel drive mode selector call the centre console home. Our family really loved the massive panoramic sunroof, complete with electronic sun shade. Driver assistance tech is surprisingly limited. There’s the Around-View cameras (providing a stitched-together picture of all four sides of the vehicle on the screen) and rear parking sensors. I think that’s about it. 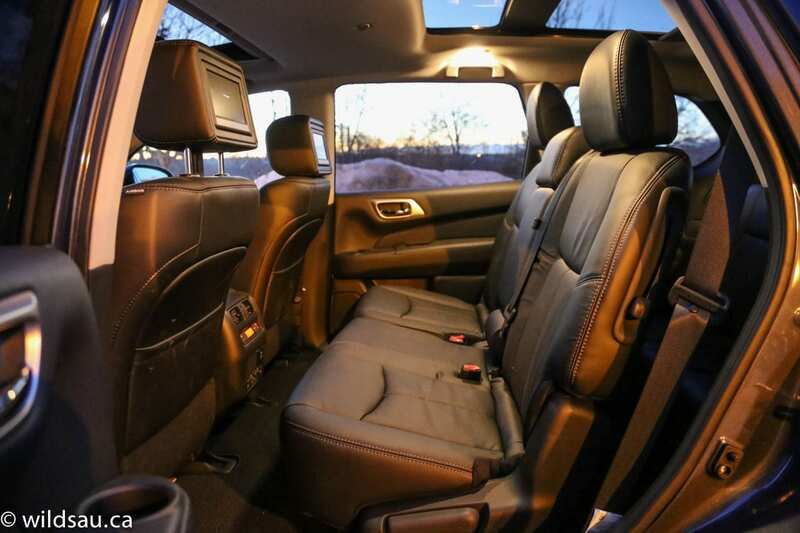 The heated, reclining second row seats are comfortable, with plenty of head and leg room and a mostly flat floor. Unfortunately the floor tracks are open which means your passengers will get plenty of dirt and grit in them as time passes. There are 7″ screens in the back of the front seat headrests – they’re nicely integrated and come with a couple of wireless headphones, but in my opinion these offer only a fraction of the utility of a couple of iPads for the kids. The back of the console holds a smorgasbord of goodies, including a control panel for the climate control, adjustable air vents, additional headphone plugs and a convenient 120V household plug. The third row has two seats – also reasonably comfortable, and they recline. Our two kids were very happy in the third row – adults wouldn’t feel the same due to the lack of leg room. 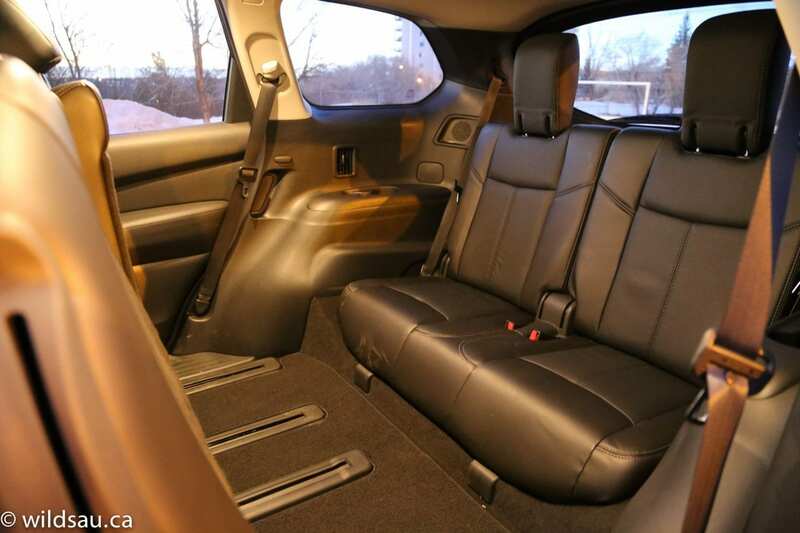 You could move the second row up far enough to make the third row adult friendly – but you’d be left with a second row that’s no longer adult-leg-room friendly. You can’t have it all, friends. 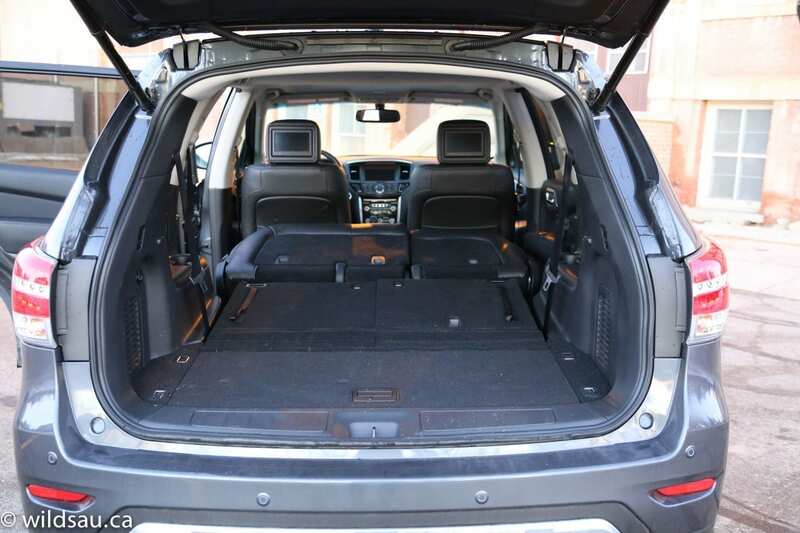 There are plenty of places to put stuff – a great drop-in tray in the console, big bin under the armrest, door bins and a sizeable glove compartment. The real story is the trunk. 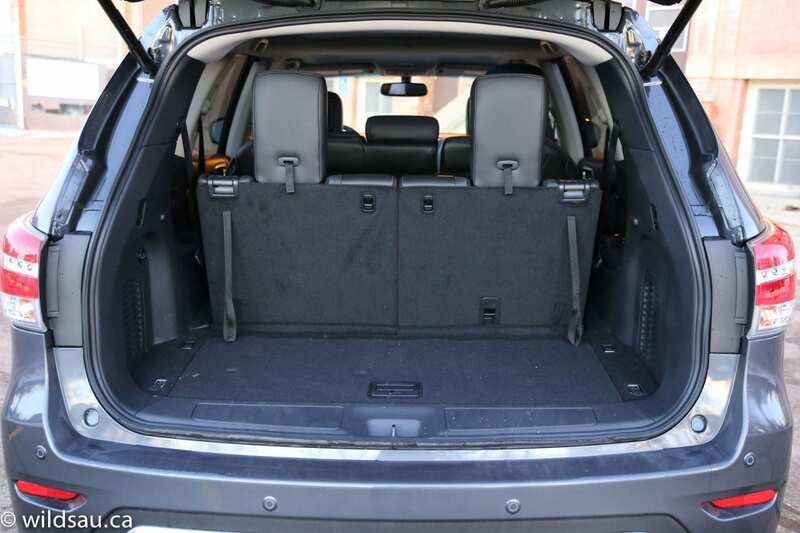 Even when you’re using the third row, you’ve got a useful 453 litres of space. This is the size of many sedan trunks, which means we were able to get all our stuff for an overnight road trip back there while using all three rows. 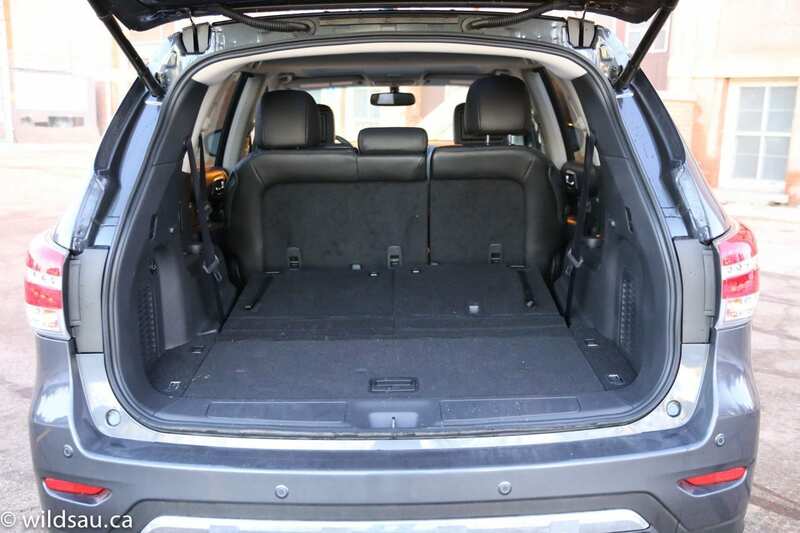 With the third row folded flat, the trunk grows to a significant 1201 litres. Fold the second row down too, and you’re left with a small apartment to rent out (2260 litres). 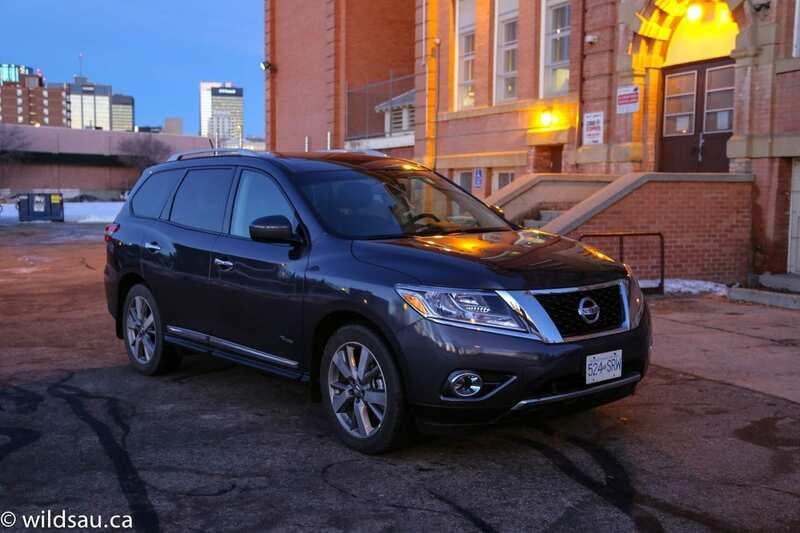 Obviously this is what sets this Pathfinder apart from its stablemates, as well as much of its competition. The hybrid Pathfinder uses quite a unique combination of things here. It mates a supercharged 2.5-litre 4-cylinder to an electric motor to make a net 250 horsepower. Fuel economy is rated at a very optimistic 7.8 L/100 km (30 mpg) in the city and 7.1 L/100 km (33 mpg) on the highway. Right. Getting back to reality, I managed to get 11.9 L/100 km (20 mpg) after the week and a 750 km road trip (averaging about 125 km/h) – for a vehicle of this size and utility, I thought that was very good – and measurably better than I was able to achieve in the gas-powered Pathfinder I reviewed last spring. What I found most interesting was that I actually had a better average fuel economy during my city driving – 11.1 L/100 km (21 mpg). Maybe the Pathfinder doesn’t like driving at 125 km/h very much. The hybrid power train is very good. I found acceleration to be very satisfying, with no noticeable lag from a standing start. 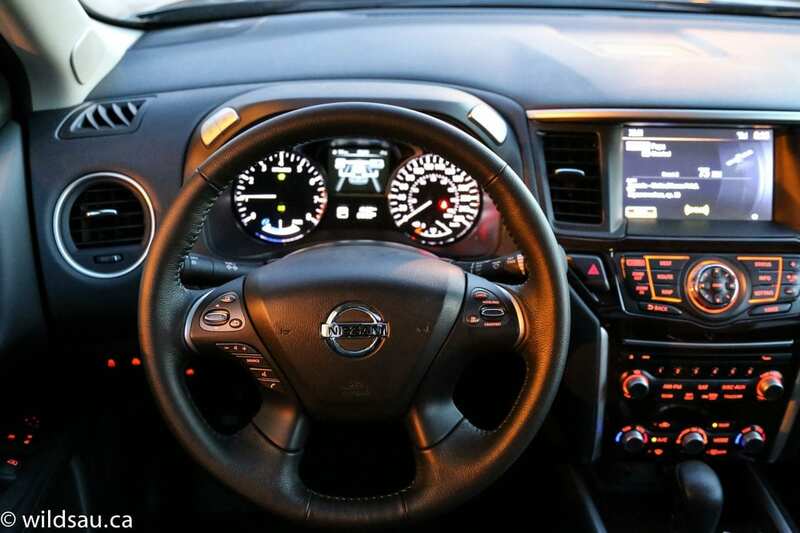 Nissan indicates the gas engine only kicks in when it needs to and the electric motor can get you going. I can honestly say it never did. 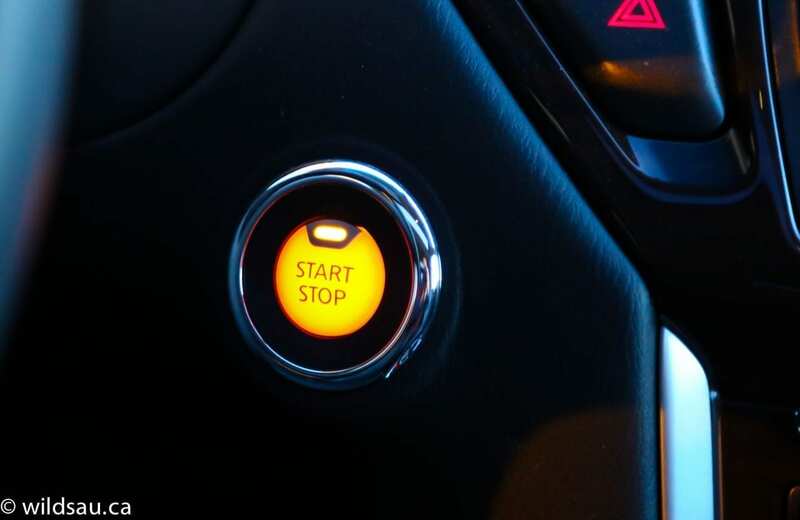 Any time I lifted my foot off the brake, the auto start/stop technology fired up the gas engine. It felt more like the electric motor was there as a helper whenever the gas engine needed a little torque. The CVT whined a bit, but was mostly decent. 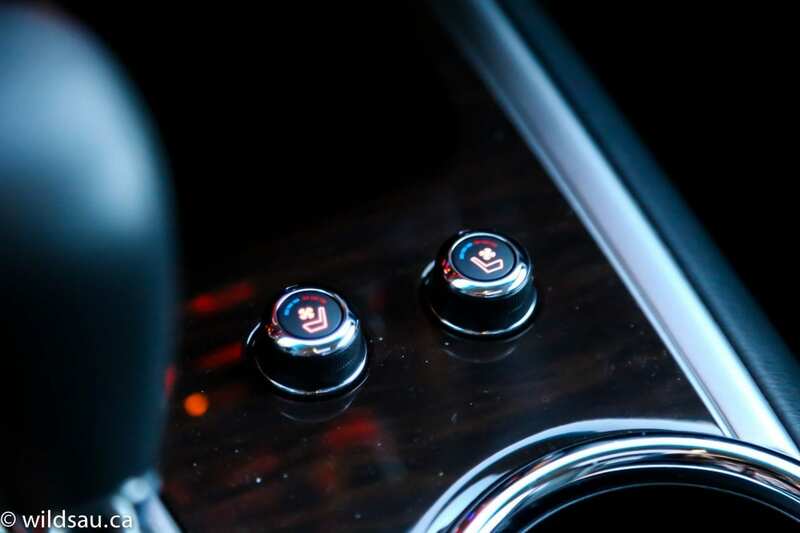 It’s responsive and provides suitable and intelligent control for this vehicle. 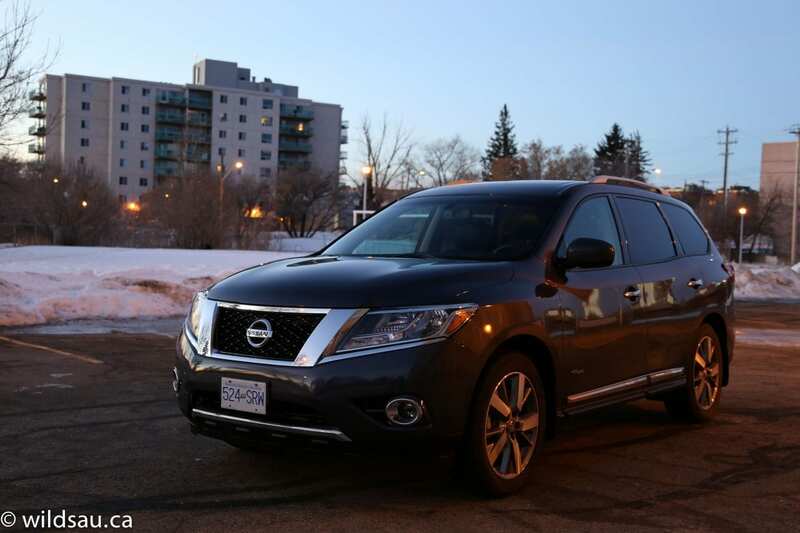 The Pathfinder has a wonderful ride in the city and on the highway – potholes, bumps, dips, whatever – nothing bothers it. It actually handles surprisingly well, though it feels top heavy around corners (because it is) and there’s some body roll for sure. Steering feel is numb and not at all communicative. 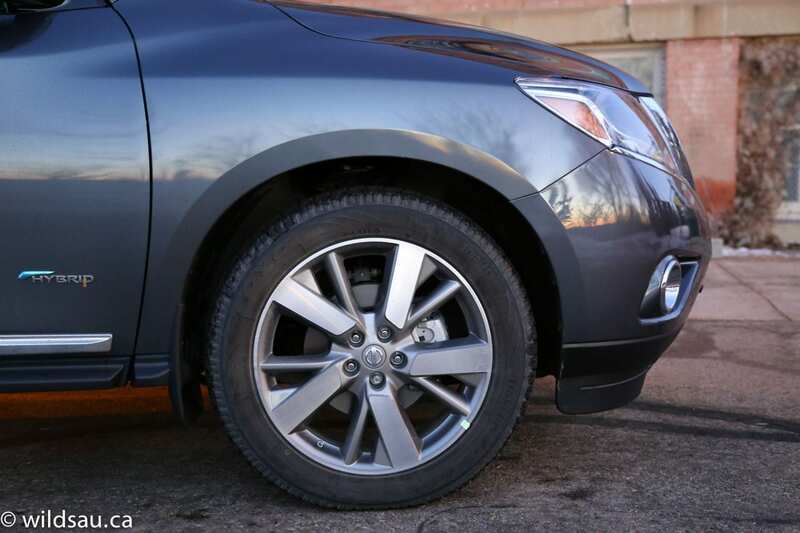 The all-wheel drive is front-wheel drive based, but effective. 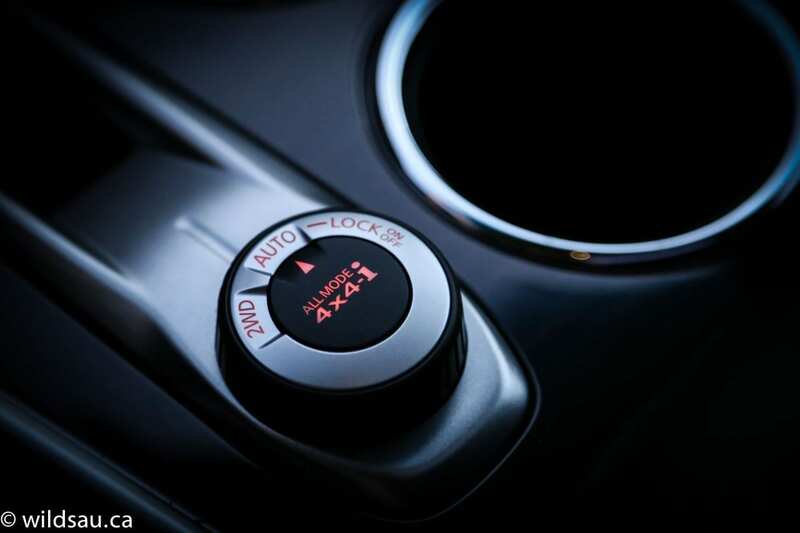 You can choose to leave it in front-wheel drive for the most efficient driving, automatic mode (which is essentially slip and grip) or you can lock it into all-wheel drive mode. It worked well on all surfaces, including brutal, ice-covered side streets. 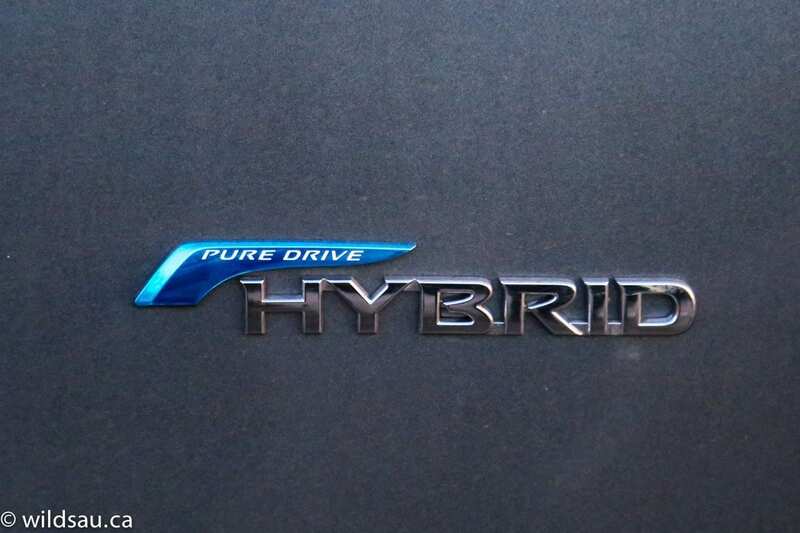 The brakes are a bit mushy – hybrids use regenerative braking energy to charge the battery – but they’re easy enough to modulate and not as bad or irritating as some other hybrids. I was impressed by the noise levels. They are quite low, including at highway speeds. Wind noise did eventually creep in but never to the point of being really noticeable. 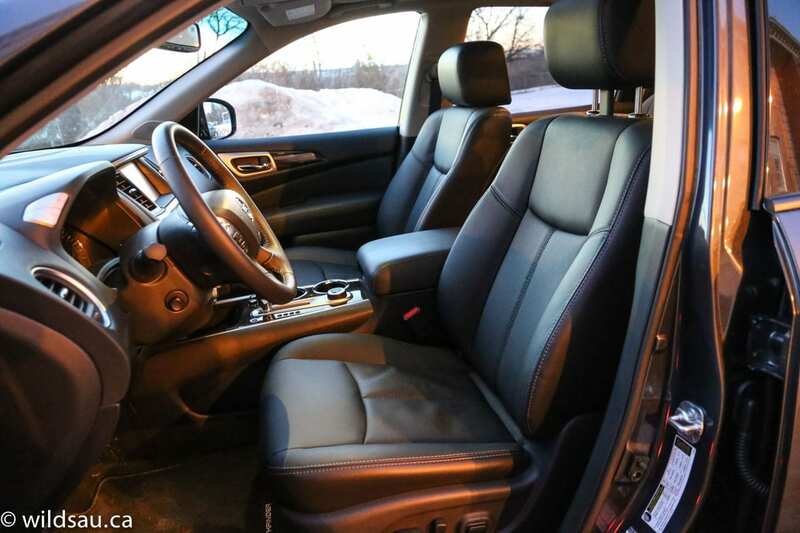 Visibility out is fine for the most part, except shoulder checking on the passenger side will have you seeing a number of headrests and the rear pillar. This is where a blind-spot monitoring system would be very handy. Also the third row headrests are these tall, skinny things that will ruin your rear view if they’re up. 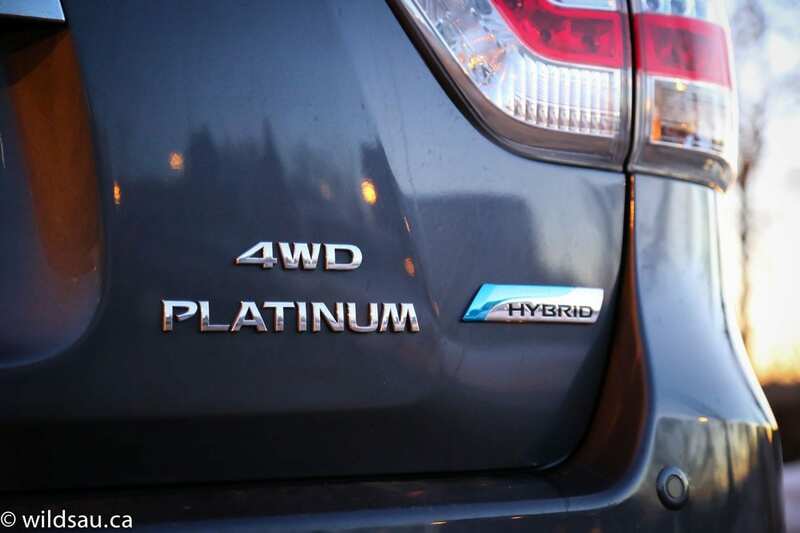 Don’t think of a hybrid crossover as a wimp – this one can tow up to 3500 pounds. As much as I appreciate the techy toys, such as the all-around camera views, I do live in Edmonton. Six or more months of winter means there’s a lot of mess on the roads, and all those little camera lenses, as nifty as they are, get dirty and essentially useless. 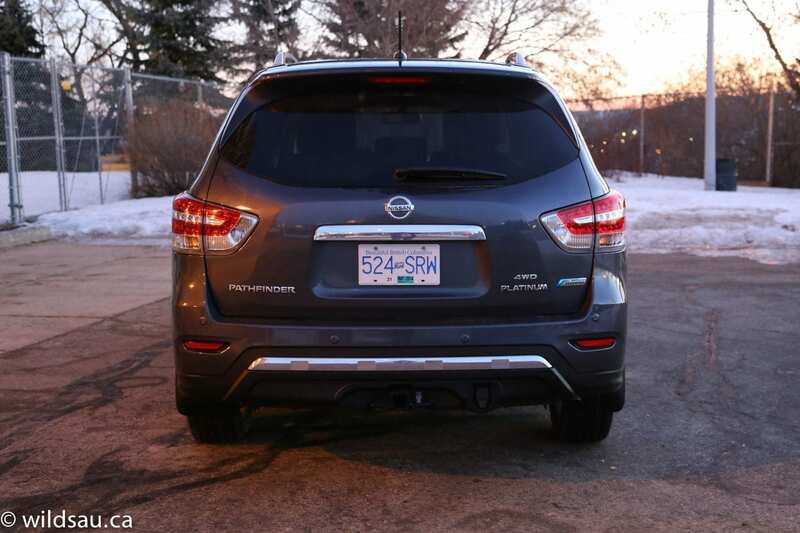 I’d appreciate front parking sensors – they’d be very helpful when trying to ease the Pathfinder’s big snout into a tight parking spot, especially when your view out of the front camera is completely obscured by road grime. I really liked the Pathfinder in hybrid guise. But there’s one catch, and it does put a little damper on the honeymoon. The price. I’ve left it to the end, as it will catch some readers off guard. Now, in reality, this price isn’t completely out of whack. 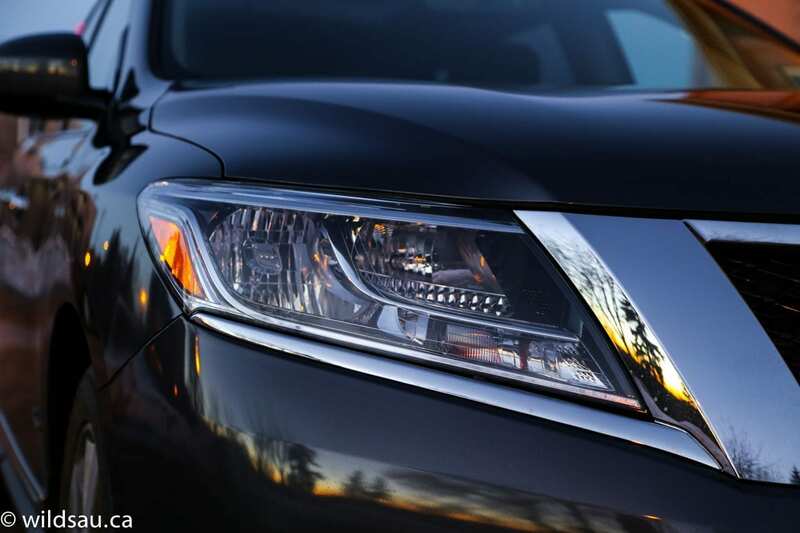 You get a fully-loaded, top-of-the-line 3-row crossover with excellent, effective hybrid technology. But still, it’s more than a lot of people want to (or can) spend. 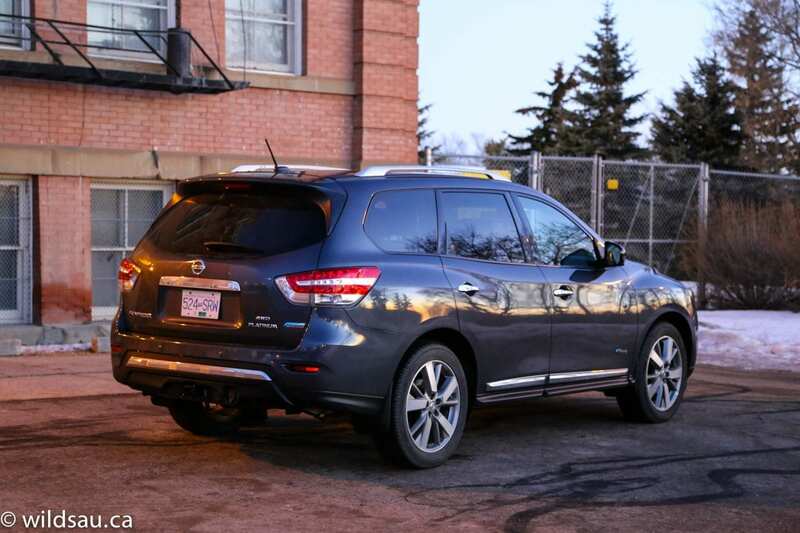 Luckily, you can pick up the well-equipped Pathfinder Hybrid SV (versus the Platinum trim I reviewed) with the same drivetrain for $39,248 – a price significantly more palatable. It’s actually the Pathfinder I’d plunk my money down for. Sure, I’d love all the fun extras in the platinum, but the SV comes done up pretty well, and for a much more attainable price. 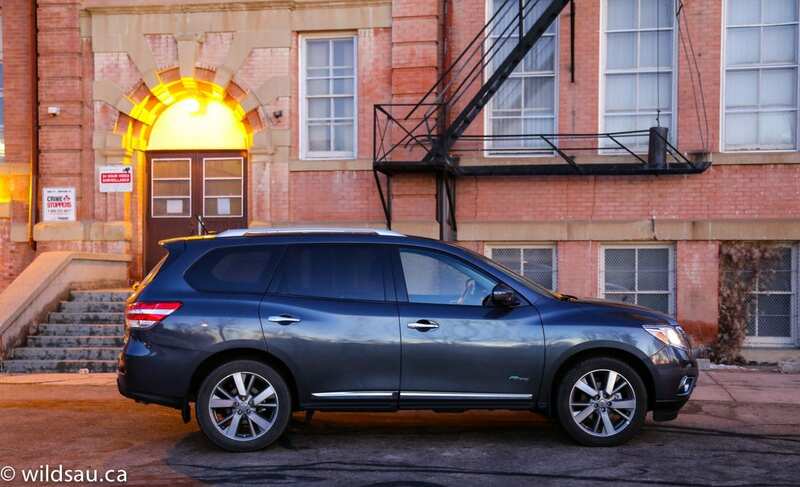 I give the Nissan Pathfinder hybrid a 7.5 out of 10. WAF (Wife Acceptance Factor) was OK. She enjoyed the high driving position and visibility of the road ahead, but found that she couldn’t get comfortable in the seats (obviously a subjective thing) and she noted that the Pathfinder didn’t feel as “controllable” as some other SUVs/crossovers she’s driven lately. 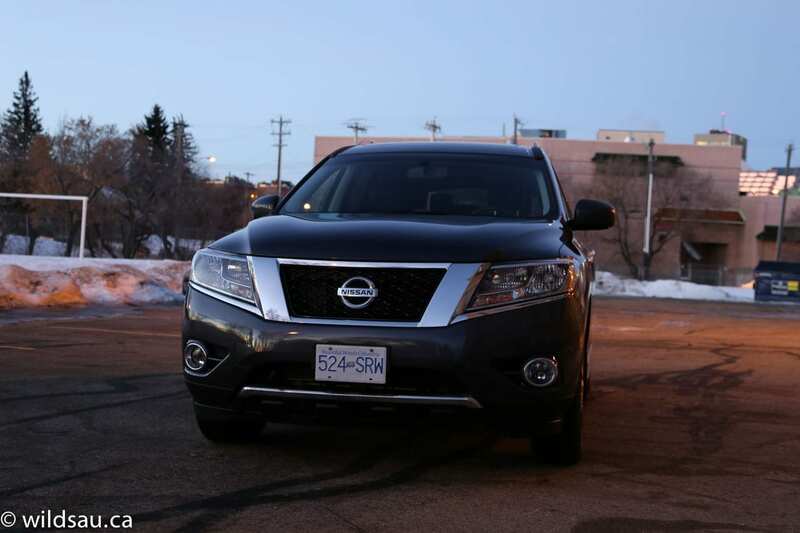 Overall I think Nissan has done a bang-up job with the Pathfinder. Did it piss some people off that it’s no longer a 4×4 truck underneath? Of course it did. Does 98% of the market care about that? Nope. They want a comfortable, easy-going machine that will happily transport them and their loved ones from point A to point B, and they’ll never, ever go off-roading with it. This is a great vehicle for that, and if you’re looking to save some money at the fuel pump, the hybrid will do that too.